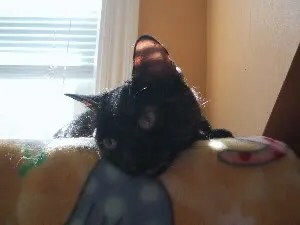 Jellybean, aka Jelly Belly, aka Jelly Belly Bean, aka The Firecracker… formally “Jellybean II” as named at the shelter. 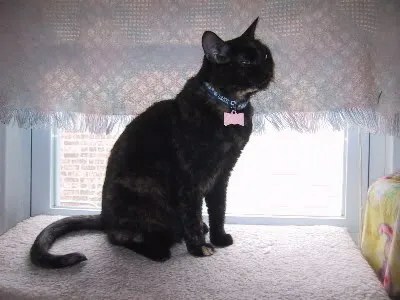 Funny (to me) as the name “Jellybean” always makes me think of a black cat (like the anise/licorice-flavored jellybeans), but my Jellybean is a tortie (tortoishell), black and red. 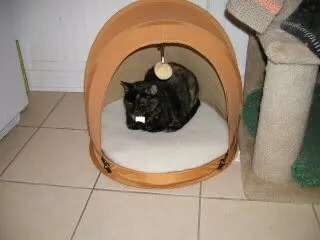 Jellybean was admitted to the shelter in February 1997, as a newborn kitten with her mother and littermates. She was adopted quickly after she was old enough to be weaned and spayed. She was returned years later for urinating outside the litter box. The shelter staff discovered her urine red with blood and treated her for an infection. She was adopted again. Again, returned – this time to a different shelter, one that wasn’t no-kill. That shelter scanned her microchip and returned her to the original shelter. In the summer of 2007, shelter staff noticed increased drinking and urination, and Jellybean was diagnosed with diabetes. She was monitored for a time, and eventually placed in the new canned food-only room at the shelter, and placed on the oral medication Glipizide. Glipizide doesn’t work for the majority of cats, and it didn’t work for Jellybean. She was placed on insulin (PZI-Vet). I adopted Jellybean in November 2006 – only a few days after she’d started insulin. I continued the low-carbohydrate wet diet (canned or raw) and tested her blood sugar levels at home. On December 30, 2006, Jellybean received her last insulin injection – she’s maintained normal blood sugar numbers on diet alone since then. We had other issues to work out, though. When Jellybean moved in, she determined she was going to be “queen of the castle”. She picked on the other cats, even my large boy Studley. My friend Jenny laughed the first time she met her, and exclaimed “Wow, she’s a *pistol*!” (several times) I think she’s a *firecracker*. Eventually, Jellybean made the mistake of attempting to start a spat with little old Afer. Afer may be 19 years old, and have kidney insufficiency and heart disease, but Afer does not take guff from *any* cat. Afer promptly chased Jellybean into the bathroom and stood in the doorway, forcing Jellybean to take a time out. It happened a few times after that, until Jellybean learned not to mess with the Afer E Granny! However, in the process, the other cats decided they had no reason to be intimidated by this little firecracker. If Afer could stand up to her, so could they! They did, and a few of them even started picking on Jellybean. She lost much of her confidence and spent more time sleeping in a cubby of the cat tree or in a pet tent, and became very fearful of Studley. I tried separating her in her own room many times, either alone or with Latifah. Then, I’d attempt to re-introduce them, but it didn’t work out great. It’s been over a year now that Jellybean’s been with us, and things are better but not perfect. I’ve seen her sleeping on the bed with Kitty.com (not cuddled together but both on the same bed), and she’ll lick Ralph on the head, and hide behind him from other cats. 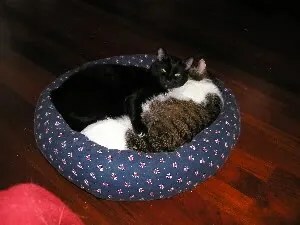 She used to lick Louie on the head, but he has teased her several times (chasing her or swatting her pet tent) and she no longer likes him much. Jellybean does not have perfect litterbox habits, unfortunately. She seems to think boxes, matts, rugs, and even dish towels lying on the kitchen counter are just as nice for doing her business as litter boxes. She is doing better – we’ve found she prefers the Smart Box or “pellet” litter (like pine) rather than clumping. We have a litter box with just a puppy housebreaking pad in it that she uses often. I find it’s easier to find something they’ll use and work with that than re-train them. Perhaps I’m just lazy or a bad trainer. Jellybean is very sweet and very cute. Her fur is very soft and she has the adorable habit of rubbing against you or furniture, arching her back so high she goes up on her tippiest of tiptoes. Though she is feisty, she quickly learned to cooperate very nicely for her blood sugar testing. I’m optimistic we’ll continue to make progress toward more peace and harmony at home. It’s been one of those weeks… or months. It’s been CRAZY busy at work. We have a huge project going on that I’m immersed in and we’re under the gun. So, I’ve been putting in extra hours, staying late, and doing some work from home in the evenings and on weekends. I had the brilliant idea to schedule dentals for three of my cats: Rumpelmintz, Omaha, and Jellybean. Jellybean had been for a regular exam in November, and the vet noted severe tartar, etc., so she needed a cleaning. 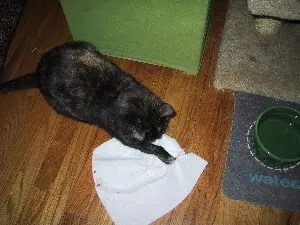 Rumpelmintz had been acting funny around mealtime – eating a few bites, then running away from the bowl and stealing food from another cat instead – a possible indication she was having some pain eating (and thought it was caused by her particular bowl). Omaha almost always indicates tooth pain, pawing at his mouth. Has since before I adopted him. Since he can’t be examined while conscious, I just schedule a dental about once a year, and they gas him down and examine and clean him all at once. I decided that rather than take a cat for a dental once every couple weeks, I’d take all three at once. It’d be time-effective, and I could charge the cost to my Care Credit card and pay it off over time with interest deferred. One thing I neglected to consider in all this, is I now have THREE CATS on antibiotics and pain meds twice daily – in addition to all the usual cat medications, sub-q fluids, and insulin injections. Jellybean and Rumpelmintz are both very difficult to pill, though I manage. Pilling them twice daily does NOT add joy and sunshine to my mornings or evenings. To top it off, we got some bad news. Omaha’s always had the mouth issues, as well as issues with arthritis and hip problems. He had a couple surgeries on his hips before I adopted him. X-rays Wednesday revealed a bone chip in one hip, also that he had malformed carpas (wrists). The vet was surprised he could walk at all. In addition, when they went to clean his teeth, they discovered his enamel was just flaking off. That means his teeth are very sensitive and uncomfortable. I guess neither the hips or teeth are something new, but now I know about them and can worry about them. My poor little man. They gave me a referral to a dentistry/surgery specialist who he will see in early January. On top of that, when I got Rumpelmintz home she was falling over and her back legs didn’t work properly. She was the last one to be gassed down, so perhaps it was just the anesthesia wearing off – but now it’s Friday and one back leg still isn’t right. So, now I’m concerned she may have thrown a blood clot. She’ll go back to the vet Saturday to be examined. I don’t want to ask “what else can happen?” because I don’t want to find out.